Join the conversation and watch these in-depth, thought-provoking discussions with some of America’s leading thinkers and figures in public life, hosted by Weekly Standard editor Bill Kristol at conversationswithbillkristol.org. 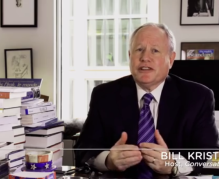 Bill Kristol talks with Yuval Levin about reform-minded conservatism, working in the White House, Edmund Burke and Thomas Paine, and the nature of a genuine education. You’d never know it from the White House, academic conferences, or the press corps, but the decline of marriage may be the main cause of income inequality.